“Decades of deception research show that the interviewer will tell truth from lies only slightly better than random, about 55 out of 100,” leading author Ross Anderson, professor of security engineering at Cambridge University, told the Guardian. 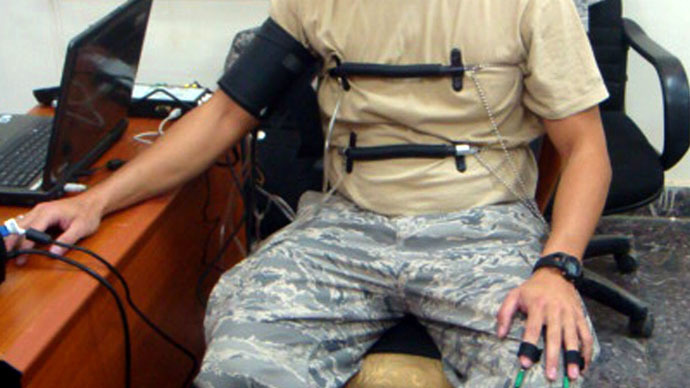 “The polygraph has been around since the 1920s and by measuring physiological stress induced by anxiety you can get to 60,” he added. The suit equipped with 17 sensors that register movement up to 120 times per second in three dimensions was tested in an experiment – with some tests showing reliability ratings exceeding 80 percent. 180 students and employees at Lancaster University were paid to either tell the truth or lie in the course of two tests. The first test was based on playing a computer game ‘Never End’ versus studying an information sheet about it, while the second one involved a lost wallet with a £5 ($8) note, which the participants were asked either to bring to a lost-and-found box or hide. “Overall, we correctly classified 82.2 percent (truths: 88.9 percent, lies: 75.6 percent) of the interviewees as either being truthful or deceptive based on the combined movement in their individual limbs,” the report stated. The cost of full-body suits is around £30,000 ($45,600), what’s more, they can be rather uncomfortable. So, Anderson and his colleagues are now brainstorming possible alternatives.